Hi! My name is Brooke Leary and I am an audit supervisor for the King County Auditor’s Office, in Washington State. We conduct independent performance evaluations of county programs and agencies. Prior to working for King County, I worked for the U.S. Government Accountability Office and find that I still look to their online resources to help inform my work. GAO is an independent, nonpartisan agency that works for Congress and investigates how the federal government spends taxpayer dollars. Their research spans topics that the federal government is involved in – which are many and varied – and they have resources online that can help inform you on key topics, methodologies, and criteria for evaluations. Lesson Learned: GAO has lots of great resources to help inspire and inform evaluations. 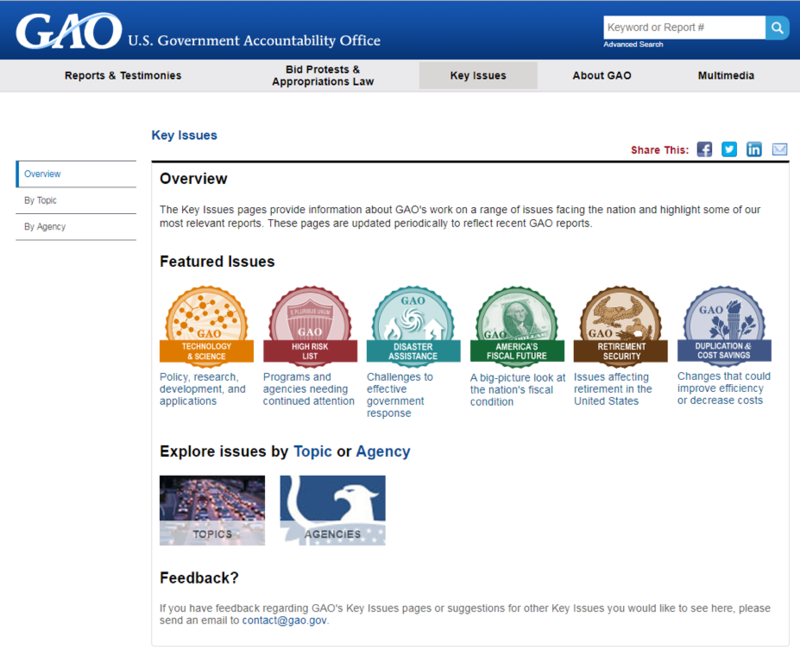 The GAO Key Issues page provides thorough summaries of the work GAO has done on a range of issues. You can browse by featured issue, by topic, or by agency and each page contains a wealth of information on the issue, related GAO reports, and links to multimedia resources such as videos and podcasts. Featured issues pages conveniently compile information on major, cross-cutting issues in one place. Current featured issue pages include “Disaster assistance: Challenges to effective government response” and “Retirement Security: Issue affecting retirement in the United States”. 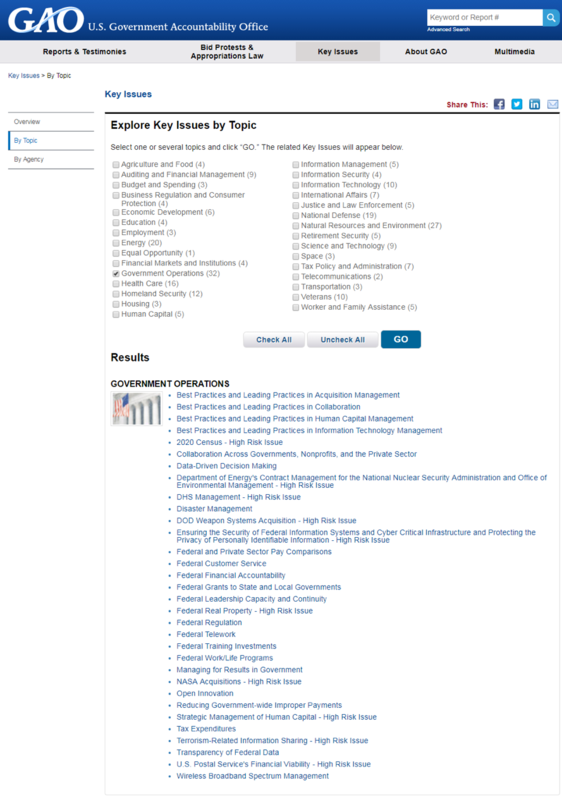 Explore Key issues by topic and check “government operations” to find a great list of reports that could serve as key background or criteria for an evaluation. For instance, check out the Data Driven Decision Making page for great criteria for use in evaluations. Check out the GAO Flickr page for data visualization inspirations and ideas. GAO posts images of the graphics from all of its published reports to a Flickr photostream. They also organize some images into albums, so if you are interested in graphics specific to a topic, this can be a good place to browse, too. Some of my favorites include GAO infographics, space, telecommunications, transportation, and health care. The GAO Watchblog is a place where GAO can provide more context for its work, tying its reports to current events and highlighting ways GAO has had impact. For example, a recent post talks about open government data and highlights key practices government agencies can take to ensure their data is as transparent as possible.